Desin, a technology company founded by a group of investors from Michigan and Ohio, has released its first product, a robotic device that helps individuals with physical disabilities feed themselves. 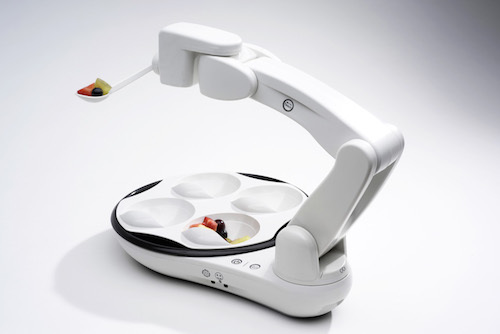 The robotic arm, called Obi, works by selecting food items from one of four compartments, and with the touch of a button, delivers it to one of several thousand possible locations where the user can eat from an interchangeable spoon. A caregiver or family member typically loads food into the device. The robot features a rechargeable battery and holds enough energy to assist with four to six meals per charge. The robotic arm is portable, fits on a dinner placemat, and operates quietly. The device, which has eight patents, is sold on the company’s website. Dekar created the initial prototype of Obi 10 years ago in his college dorm room after seeing, through his aging grandfather and a six-year-old girl with arthrogryposis, what challenges people with disabilities face. He co-founded Desin in 2010 with his father, Tom Dekar, former vice chairman at Detroit-based Deloitte. To learn more, visit meetobi.com.